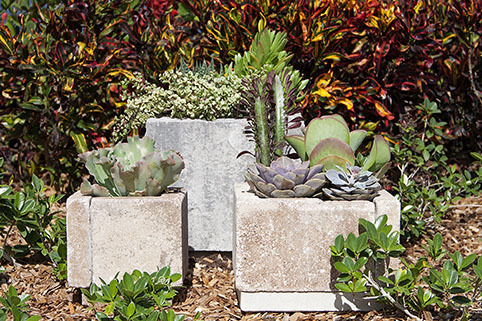 No matter whether you have downsized and have limited space, or if you have a substantial property and just want to improve your garden scene, you might consider “container gardens.” Here are tips from Justin Hancock, Costa Farms, Miami, Florida. Container gardens are an easy way to create instant impact on your porch, patio, balcony, or other outdoor space. Few pieces of décor create the warm, welcoming feel of live plants. Plus, a beautiful container garden or two is inexpensive and endlessly customizable. Beyond their beauty, plants are a proven way to add value to your outdoor spaces. Real estate professionals have shown that you can enjoy more than 100 percent return on investment with fresh landscaping. This isn’t limited to putting plants in the ground — you can also boost curb appeal and value with container plantings. Utilize containers for beauty, but enjoy other benefits too. There are a variety of ways you can make practical use of pretty container gardens. Want to shield the view from your neighbors? Use a line of tall plants like majesty palm to create a lush green backdrop for your favorite outdoor space. Underplant with low mounding or trailing plants to keep the pots colorful from top to bottom. Strategically placed containers are perfect for helping direct traffic. For example, a pair of planters on both sides of a walk help draw attention to the entrance. Or a few pots in the right place on your patio can act like an informal room divider, making it feel like you have a special area for dining. Add fruits, vegetables, or edible flowers to your planters to make them do double duty. A large cherry tomato plant supported on a trellis and planted with basil and nasturtium, for example, creates an elegant look you can harvest from. Eggplants bear attractive fruits and pretty purple flowers, chili peppers such as ‘Basket of Fire’ are bedecked in colorful fruits, and lemongrass has the trendy look of an ornamental grass. Whether you buy pre-made containers or design your own, use these strategies to make the most of your display. Coordinating the color of your container with your plants and home is an easy way to create a high-impact look. If your style is more understated, try colors next to one another on the color wheel, such as blue with purple or yellow with orange. If you want a more eye-catching look, go with contrasting colors (those opposite one another on the color wheel), such as blue with yellow or purple with orange. One container by itself is nice, but you can easily take it up a notch by clustering a few containers together. One simple way to make the most of this is to plant in multiple sizes of the same container. A small, medium, and large pot all of the same color and style, for example, offers an elegant look. Lift the Eye with Layers: Boost the interest level by using visual layers. Use a tall, dramatic plant like majesty palm or canna in one pot, a medium-size plant like purple fountain grass or coleus in another pot, and tidy little plants like petunia or calibrachoa in a third pot. Plants of differing heights help draw the eye through your display. Everyone’s situation is a little different, but here are a few plants you can’t go wrong with for challenging areas. Plants for Shade: If you don’t have a bright, sunny spot, it can seem like there aren’t a lot of choices. Here are a few you can’t go wrong with. • Caladium: Tropical plants with lush, heart-shaped leaves splashed and streaked in shades of red, pink, and white, caladiums have been tried-and-true favorites for generations. • Coleus: Coleus plants are big, leafy beauties with fantastically variegated foliage. They’re commonly available in shades of chartreuse, purple, red, hot pink, orange, and green. • New Guinea Impatiens: These mounding plants show off large flowers in practically every color except true blue and yellow. • Angelonia: A stately plant with spires of blue, lavender, pink, or white flowers, Angelonia holds up to the heat, resists drought, and is ignored by deer and rabbits. • Mexican Heather: An adorable little plant that’s practically indestructible, Mexican heather bears loads of little lavender flowers on a tidy, bushy plant. • Pentas: Hailing from the tropics, pentas loves summer heat. It shows off hydrangea-like heads of star-shaped flowers loved by butterflies and hummingbirds. • Snapdragon: Snapdragons are old-school plants that are hip again today. They feature dragon-shaped blooms that are often fragrant. There are tall varieties, as well as short, bushy types, so there’s one for every container planting. • Sweet Alyssum: You’ll love this trailing plant, which covers itself in pink, purple, or white flowers, for its delightful fragrance. It’s frost tolerant, too! • Viola: Violas are adorable pansy relatives that survive below-freezing temperatures and come in practically every color, including sky blue and nearly black. • Desert Rose: This spectacular succulent offers big, bold flowers on a tidy little plant with a thick trunk and dark green leaves. • Echeveria: One of the trendiest succulents around, echeverias grow in a little bird’s nest shape. Some varieties are green, others purple, but most are a chic shade of silvery gray. • Kalanchoe: There are a wide variety of kalanchoes from which to choose; all hold up well to hot, dry spots. One of my favorites is panda plant (Kalanchoe tomentosa), which offers leaves covered in soft, silvery hairs. Justin Hancock is a professional horticulturist and gardening expert at Costa Farms of Miami, Florida. He has been a garden editor at consumer magazines and websites for more than 20 years. Hancock has appeared on national television programs featuring gardening and has produced videos for Costa Farms and the Better Homes and Gardens brand.